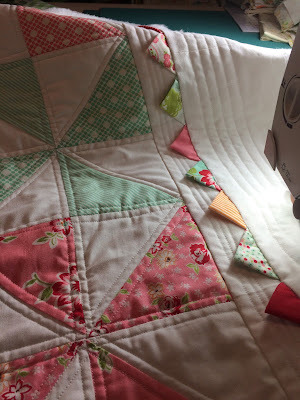 I am working to finish up the pinwheel baby quilt. I am trying to finish up the quilting. It certainly takes a long time. The center portion took me about 5 hours! Lots of straight line quilting going on right here. I did a few lines in the small border and decided to mimic that in the larger border. I'm pretty happy with how this turned out. I now need to square it up and choose the binding. I am hoping that this one will be completed soon. I would love to be able to cross it off my "finished" list. Next up are getting my January Bee blocks made and mailed. I've had the same quilt on my project list for sometime. I love yours! Great quilting. I have a project that requires Prairie Points and they scare me! looks so adorable! This is so pretty! I have the same quilt all cut and ready to sew, even in the same prints. I just have to make time to do it. Yours is sure inspiring! Great work! Very sweet! The quilting is perfect. Good job! I have made 3 baby quilts with this pattern and love it!!! Your quilting and fabric choices is awesome! Oh that quilt is so pretty. Love your prairie points and the quilting.